Benefits : Improves blood circulation, keeps skin healthy and free of infections. Ingredients : Sun dried and powdered Green Gram, Khadira, Turmeric, Manjishtha, Almond, Neem Leaves, Amla , dry ginger, vacha, orange peel, Tulsi, aloe vera, rose petals and aloe vera. 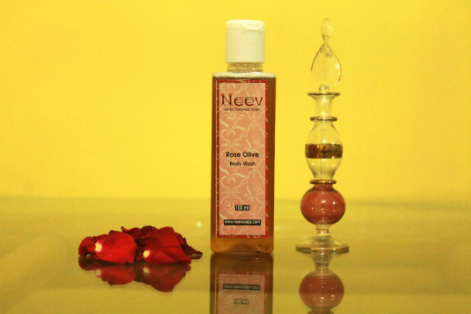 Benefits : Olive Oil is a rich moisturizer and provides Vitamin E to skin, Geranium Oil is an astringent and skin toner, Rosemary Oil removes dryness, the fresh aroma of Rose Oil keeps you charged and happy, Palma Rosa keeps the skin soft and moist.. Ingredients : Olive Oil, Coconut Oil, Lye, Tween 80, Distilled Water and pure essential oils of Rose Oil, Geranium Oil, Rosemary, Palmarosa, Rose Petals.. Ingredients : Olive Oil, Coconut Oil, Fresh Aloe Vera Extract, Lye, Tween 80, Distilled Water, and pure essential oil of Lavender, Rosewood oil, Patchouli. Benefits : Gentle and yet tough scrubber for heels and elbows. The olive rose soap softens the skin on heels and prevents cracks while liufa removes the stubborn dirt sticking on the foot. 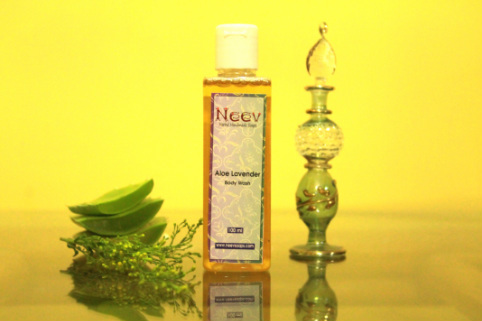 Ingredient : Slice of Natural Lufa from Neev's Herbal Garden, filled with Olive Rose Soap.